Despite the cluster's size, NGC 4696 still manages to stand out from its companions—it is the cluster's brightest member, known for obvious reasons as the Brightest Cluster Galaxy. This puts it in the same category as some of the biggest and brightest galaxies known in the Universe. Even if NGC 4696 keeps impressive company, it has a further distinction: the galaxy's unique structure. Previous observations have revealed curling filaments that stretch out from its main body and carve out a cosmic question mark in the sky, the dark tendrils encircling a brightly glowing centre. An international team of scientists, led by astronomers from the University of Cambridge, UK, have now used new observations from the NASA/ESA Hubble Space Telescope to explore this thread-like structure in more detail. They found that each of the dusty filaments has a width of about 200 light-years, and a density some 10 times greater than the surrounding gas. 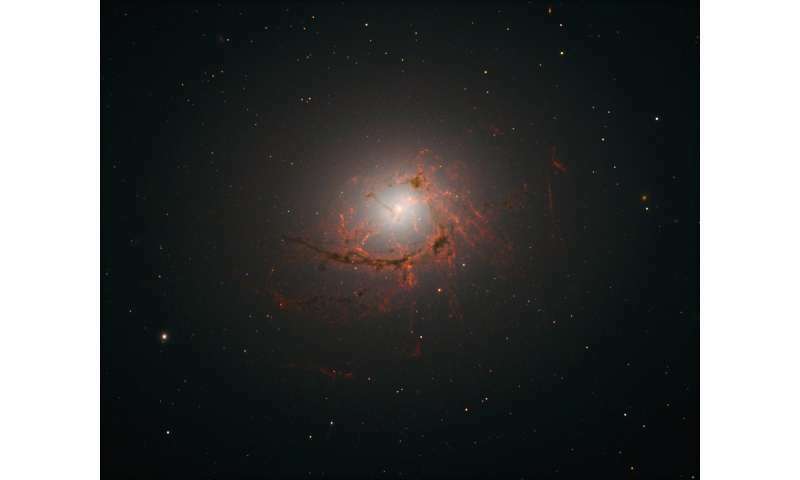 These filaments knit together and spiral inwards towards the centre of NGC 4696, connecting the galaxy's constituent gas to its core. In fact, it seems that the galaxy's core is actually responsible for the shape and positioning of the filaments themselves. At the centre of NGC 4696 lurks an active supermassive black hole. This floods the galaxy's inner regions with energy, heating the gas there and sending streams of heated material outwards. It appears that these hot streams of gas bubble outwards, dragging the filamentary material with them as they go. The galaxy's magnetic field is also swept out with this bubbling motion, constraining and sculpting the material within the filaments. Whoever penned this nonsense has the equivalent understanding of a 3-year old autistic crack baby, with a case of the Cap'n Stoopid disease. This explanation is so far from real plasma physics it's deplorable it was even uttered. The state of astrophysics is laughable! OK. Now you have access to the paper. Point out where in the paper they go wrong if you can. are dragged out by the bubbling action of the radio source as part of the AGN feedback cycle." That is utter pseudoscience, maybe one of the electric engineers that peruse these threads can explain how "bubbling action" fits into circuit theory that is used to describe electric circuits in plasmas? Additionally, there is no "gas" present, it's plasma and as such their gas dynamics/physics they rely upon are meaningless in describing the plasmas they're observing. On top of that, they also rely on the pseudoscientific magnetic reconnection to explain energy transfer in the filaments, they use all the pseudoscientific tools in their toolbox. you use the RNP fallback to make yourself feel relevant, but you're still never relevant in spite of trying to change your tone. Your claim the Phys1 and I are the same person is clearly ridiculous. A glance at our writing styles and/or activity records make this obvious to anyone with any sense. I, for one, will spend no more time responding to this childish nonsense from you. Yep, I would agree RNP and Fails1 are different people with different writing styles. Whether or not they reside outside of the same body is questionable. ...the bubbling action of the radio source as part of the AGN feedback cycle."... is utter pseudoscience...maybe one of the electric engineers that peruse these threads can explain how "bubbling action" fits into circuit theory that is used to describe electric circuits in plasmas? The actual mechanism for the bubbling action is described in the paper and reference therein and and has nothing to do with currents in plasmas. I guess you never bothered to read it. You mean the observationally confirmed magnetic reconnection. Exactly! But the opposite is in fact accurate. Your (and astrophysicists) belief that plasma can be treated as a gas results in the fact that astrophysicists are missing 96% of their Universe and must invent 96% more "dark" stuff to explain their reality. WRONG. I defy you to find anywhere in the paper where they use such inappropriate physics. The dark matter/energy obfuscation is irrelevant. ..........yeah, I know, it's the diametrically opposite writing styles which is the most obvious clue, or you get kicked off when you go on another one of your foul mouthed profanity filled rants as Phys1. ......and here we go, yyz (Phys1), & RNP in lockstep. When one or the other posts, the other two followup votinf 5 Stars upvote or 1 Star downvotes in sync within minutes of one another........now what could be a better clue? Read it again, the linked tripe is laced up and down with pseudoscientific principles of "ideal gases" being applied to the plasma. There are references to pseudoscientific nonsense such as magnetic reconnection and black hole bs. No mention of circuitry, current density, Birkeland currents, Marklund Convection or any other properties of real plasma physics. Nope, just the typical fanciful preponderances of plasma ignoramuses blathering on about their non-existent matter. where is your own peer reviewed journal studies that were validated by secondary sources that demonstrate your "superior" plasma physics processes which replace the modern plasma physics? OK. So go ahead, it should be easy for you to give us one specific example and the relevant section of the paper. So yyz is me? Amazing, even I did not know that. I always knew you were too stupid to be one person. There is no "relevant section", it's all 3-year old autistic crack baby with a twist of Cap'n Stoopid type tripe. If you do not understand the paper that you so roundly condemn well enough to give a coherent response to a reasonable question there no point in trying to discuss it with you. You clearly do not know what you are talking about. Your absurd ranting only underlines your irrationality. You clearly do not know what you are talking about. Your absurd ranting only underlines your irrationality. Phys1.....almost everything you post reads within small variations of what you just posted in the above highlight. Why don't you cease with this boring tact of constantly repeating yourself. Address the actual issues of the math & science involved in lieu of your customary name calling rants. "The filamentary nature of the cold gas continues inward, swirling around and within the Bondi accretion radius of the central black hole, revealing the magnetic nature of the gas flows"
...shows a complete and utter ignorance of real plasma phenomena. First, there is no "gas", it's plasma and even if there were some portion of the matter that were a "neutral ideal gas" the "gas" is immersed in a sea of plasma which will cause the "gas" to experience phenomena driven by plasma physics and EM forces. Don't bother. You again give NO reason for us to believe your nonsense. Secondly, the "magnetic nature of the gas flows" are due to one salient fact. The "gas flows" are in fact electric currents of plasma which in turn create the "magnetic nature" of the flows. Now it would seem that these astrophysicists should know this, right? Maxwell's equations and 300-400 years of empirical research on EM Theory would suggest this, yet we get a word salad of obfuscation or ignorance discussing "gas flows", magnetic fields being "swept" about, and "intriguing spiral shapes" by the filaments. Alfven predicted way back in 1937 the Universe would be filamentary and cellular, because that's what plasma does. Magnetic fields aren't "swept" about, they are generated by electricity ("gas flows" if it makes more sense) and move about because so too are the flowing charges. And "intriguing spiral shapes" of the filaments is a completely expected morphology of electric Birkeland currents, the vortex of interacting charges is well understood by the experimentalists. So, you still can not make any real comments about the paper and are going to simply regress to repeating your pseudo-scientific mantra. You are a waste of my time. You address the wrong person. NO, I did not......RNP, what methinks is that you protest it way too much, adding additional credibility to the fact that I'm addressing the right person. Phys1/RNP- I'll bet I could come up with some poetic verse for this label. Keep reading & be on the look for some rhyme time masterpiece from me dedicated to you. You are a full blown idiot, Benni. :) That's ok, with so much of your brains missing. Lol. Coming from somebody who thinks a diamagnetic cavity is a f***ing double layer!!!!! Idiot. Yes, but can you do them better than this f***wit? Please don't make us all laugh, and tell us that this is who you are a fanboy of! That would be bloody hilarious. Hey gobsh*te, I'd actually like to see you practice what you preach; SHOW US THE EVIDENCE. Where is this crap that you keep droning on about? Prove it. Mathematically. If you can't - then a) either STFU, or b) link us to the genius of whom you are a fanboy. After all, you are a self confessed engineer - I can't imagine that your maths is up to much, from experience. So let's see it, yes? Otherwise, as I said STF........ you understand? Alfven predicted way back in 1937 . Ohhh, Alfven, Alfven, Alfven. Idiot (not Alfven). He died 20 frigging years ago. Stuff has moved on. He came out with a lot of stuff. Some of it was right. A lot of it was WRONG. Understand? Demonstrably bloody wrong. What the hell is it with you idiots? Trust me, if he/ she got anywhere near an actual plasma physicist, he/ she would sh*t him/ herself! It is all learned by rote from Dunderdolts.misinfo.